Nearly three decades later, the baby is all grown up and looking for her biological mother — and tens of thousands of people are trying to help. In 1986, a newborn wrapped in a red sweater was found abandoned in the bathroom of a fast-food restaurant. Nearly three decades later, the baby is all grown up and looking for her biological mother — and tens of thousands of people are trying to help. 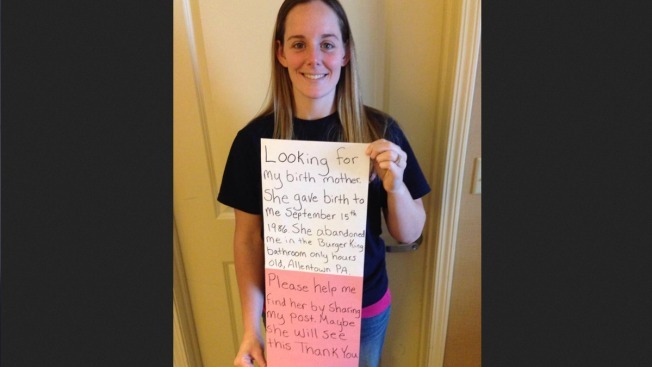 Katheryn Deprill began her quest on March 2 by posting a photo on her Facebook page in which she held up a sign that said, "Looking for my birth mother ... She abandoned me in the Burger King bathroom only hours old, Allentown PA. Please help me find her by sharing my post."